V.com weekend vote: Would you rather play first or second violin? November 18, 2016, 9:59 AM · The mindset around first vs. second violin is so deeply ingrained in our culture, even completely non-musical people occasionally say, "I don't want to play second-fiddle to such-and-such...."
It means "I don't want to be second in line" or "I don't want to be considered inferior." Let's just get this straight, my friends, we all play the violin (or viola or cello) -- nobody here is inferior! That said, the first violin part is often considered "harder" because typically it shifts to higher positions and can have more virtuosic stuff in there. But it's not always the case; a few examples include the Bach Double, with its equally difficult parts; the Moldau with its relentlessly noodley second part while the first violin sails easy on top; there are plenty others. Easy or hard, it is true that first violin parts tend to have the melody and spotlight much of the time, with the second violin in a more supportive role. Whether you like those roles really depends on your personality. I really like that supportive role, maybe because I'm a teacher. I play duets quite often with my students, and of course they are playing their solo part. I enjoy being able to encourage a crescendo and other musical behavior by making it happen in that supportive music. But the difficulty of either part is not the point, or at least it shouldn't be. Making music together is the point, and doing it as, well, harmoniously as possible! 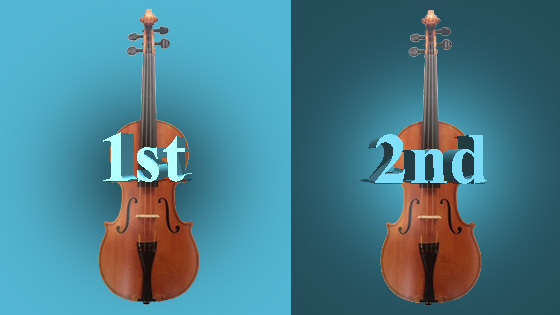 Which do you like to play better, first or second violin? And if your answer is "both," tell us what you are in the mood for today, for example if you were to sit down in a quartet and someone said, "first or second today?" which one? Some years ago when I made that final walk from my cello chair to one in the Seconds I was immediately struck by the amount of detail I was hearing around me, from all sections of the orchestra. Back in the cello section I think I must have missed out in a lot of the detail coming from the violin sections, the only string sections coming through clearly being the violas (next door) and the basses (behind). I think that starting orchestral newbies in the Seconds is the best general orchestral education you can give them, no matter their level of technical ability or previous kinds of non-orchestral experience they may have had. November 18, 2016 at 07:18 PM · Honestly I prefer first violinist because everything I've worked on over the years are the solo pieces and I’m a melodic player as opposed to harmonic player. Working on second violin part is not as easy for me because the music of vln2 often doesn't make as much sense as that of vln1 does to me. Of course I consider this to be my weakness as a violinist and musician and I am trying to play the second when I have the chance. November 18, 2016 at 08:01 PM · I don't care, honestly, but first violin parts are the easiest to memorize because they usually have the melody. November 18, 2016 at 09:39 PM · I voted "First" because it's part of my personality. In reality, though, if I were to sit down in a quartet today, I'd be happy with first or second -- I like to trade off. I started playing in elementary school, but didn't get any orchestra experience till early high school. I felt like the little kid crashing the big kids' party, since most other players were juniors and seniors. Our director started me in the middle of seconds, probably because of my youth and lack of previous orchestra experience. The following semester, I got "kicked upstairs" -- if I may dare use this expression -- to firsts. I could already handle the higher positions, which undoubtedly had something to do with it. Same pattern during my degree program when I played a couple of seasons in the CSO's training school -- plus one summer session first. I started this training in my late teens. Most other players, it seemed, were 5-10 years my senior and had a lot more orchestra experience. Within a few weeks, a member of the administration tapped me to come over to firsts. I even remember the two scores we rehearsed that afternoon: Sibelius 2 and Richard Strauss's Tod und Verklärung (Death and Transfiguration). November 18, 2016 at 09:52 PM · I think all quartets should alternate them. November 19, 2016 at 01:51 AM · I don't play chamber music, but I have played 2nd violin in orchestra for years. I don't really like playing all those high notes on the E string because I don't care for the sound. The only time I didn't like playing 2nd violin was a concert that consisted almost entirely of Strauss waltzes - my arm was aching by the end of the evening. I wished for that one concert that the first and second violins could have switched parts every other waltz so nobody's arm would get too tired. November 19, 2016 at 01:52 AM · I was in the audience a few months back at a quartet recital at Bristol Music Club where the 1st and 2nd violinists did just that, swapping over for the second half of the programme. In Bristol Chamber Orchestra it is regular practice about twice a year for two or three players to be exchanged between the firsts and seconds - the only one who wouldn't be so changed is the CM. November 19, 2016 at 02:21 AM · There's nothing better IMHO than playing Dvorak chamber music on viola. We get the best of both worlds - melody (often the opening melody) and couterpoint. November 19, 2016 at 04:03 AM · I voted 2nd violin, especially for the Bach Double. Moldau 2nd Violin = Whitewater Rafting! November 19, 2016 at 04:44 AM · I've actually enjoyed doing both but if I had to pick one it would be first. However, I've often enjoyed playing principal 2nd in orchestra: "better to rule in Hell than serve in Heaven", as Milton's Mephistopheles would have it. As for difficulty, there are some notable exceptions to the rule of the first part being harder. I feel that in the Bach Double, the 2nd part is marginally harder in the first 2 movements - harder to articulate some passages in a lower range, whereas the 3rd movement is a bit harder for the first. In orchestra, as mentioned, the Moldau, and the opening allegro in Mozart's Magic Flute is all 2nds and so exposed. And the 2nd part to Verdi's "Va Pensireo" - as they say in Brooklyn, "f'gedaboutit"! And yes, in a different way, playing 2nd in Strauss waltzes. I once was put in 2nds for a concert consisting mostly of Strauss waltzes. Half way through I was pretty much praying for death! November 19, 2016 at 04:50 PM · The art and joy of playing second violin lies in colouring just as intensely the maybe less melodious or ear catching part as the same colours of the melody. Harmonies are to be coloured too. Shining with the melody when playing first is fun too. November 20, 2016 at 02:34 AM · In orchestra playing I prefer first violin because that is the repertoire that I have always played. However in quartets, I prefer second violin. November 20, 2016 at 03:19 AM · My son, who is often the first violinist, said it's easier than second, because of having the melody. He prefers second or viola! November 20, 2016 at 06:22 AM · I was all set to answer "second violin" but then I saw that "I play the viola" was also a choice. I do play viola in my beginner-ish string quartet and prefer it. But if I had to play violin, I'd choose second because in the quartets we play (mostly Haydn and Mozart), the 2nd violin often plays along with the viola. I decided to put "second violin" after all, because it's more in the spirit of the vote. @Mendy, thanks for the tip! I'm always on the lookout for new string quartets to master. November 20, 2016 at 02:42 PM · Since I passed my mid-70s it's just safer for me to play 2nd. Most of my life I played 1st. All the good things they say about 1st are true (for me anyway). These days I mostly play viola or cello. November 20, 2016 at 04:44 PM · For me it has evolved. It depends a lot on where in the section I'm sitting and who I'm sitting with. I hate the back of the first violins, just hate it. I can't see well or hear well, feel isolated, and like I'm swimming upstream. I tend to rush or otherwise get off the rest of the group when I sit there because I can't hear the pulse well enough. I don't mind the back of the second violins or violas though, at least in the traditional seating of 2nd violins when they are in the interior next to the firsts. Because there I'm still in the middle of things, surrounded by other players, and in front of the conductor, so I can see and hear what's going on in the rest of the orchestra. (I've never played in the back of the 2nds in the opposite-to-the-firsts conformation, but I'm thinking I would hate that too for the same reasons.) I like sitting in the front of the firsts, leading and being right under the conductor, but it's a rare and special opportunity to be able to sit there. First violin in chamber groups is fun like that too, but it can be too much pressure. Often as the first violinist you're the one who is expected to set the tempo or make musical suggestions or lead the rehearsals in other ways, and I'm not always up for that. And a lot of 1st violin chamber parts are difficult to sight-read and very exposed so it makes it harder to just get together with a group of friends and play through stuff for fun. I play viola most often in chamber groups these days, and I love it. My alto clef sight-reading has finally improved enough that I can at least get through most viola chamber parts on first reading without getting lost, practicing and polishing the music is very rewarding, and I really enjoy being the bridge between the upper and lower voices. November 21, 2016 at 12:40 PM · I preferred the first to the second because until I had to have my violin re-done the tone was highly suitable for playing the tune (especially in Brahms 4). On the other hand, I don't like not hearing the seconds when I'm in the audience or choir (This latter happened once at a near dress rehearsal of Messiah. I went to the organizers and pressured my way into the orchestra; as a second, even though I'd never played that part before). I haven't played anything but viola in orchestra now for some time. Generally, playing first or viola comes more naturally to me than playing second - I'm not sure whether to vote 1 or 3! November 21, 2016 at 07:30 PM · I play second in MY orchestra. I don't like the acoustics in the hall but that is the same issue no matter where I sit or what position I play. I have seen over the years new people coming in, insisting they play first. They have a scowl, and feel belittled when the conductor motions them to second. Same thing happens in church orchestra. Everyone wants to play first as if that is a testament to their greatness. There are so many difficult passages in second and with the hooty-tooty attitude of the firsts, I will remain a second with the harmony. EXCEPT....like someone else commented: Playing a waltz without my arm falling off is problematic. I was told, when invited to play for a dance group, we would switch, 1sts and 2nds....but we did only for a short time, like one short piece, with the 1st grumbling constantly, then insisting we go back to our 'original' positions for the rest of the evening. I won't make that mistake again. November 22, 2016 at 06:44 AM · @Karen, are you playing violin in a community orchestra this year? I finally gave up on violin because I couldn't do justice to both the treble and alto clefs. @William, are you in Berkeley Baroque Strings? I saw your name on the program 2 weeks ago. But what you wrote isn't consistent with that group! However, if I were to play violin in an orchestra it'd definitely be 2nd - I don't think I could handle the nosebleed positions the firsts get into. As for Strauss waltzes, the 2nds have it easy - try holding up a viola for that much oom-pa-pa.
November 24, 2016 at 07:00 AM · I prefer firsts in an orchestra - unless I am with players a lot more advanced than me. If I'm having a sore left wrist day, I wish I was in the 2nds when playing stratospheric Tchaikovsky, for example. In chamber music I prefer first if I am the stronger violinist. Earlier this year I had the opportunity to play with a much stronger violinist, and I immensely enjoyed playing 2nd while she worked harder than me.